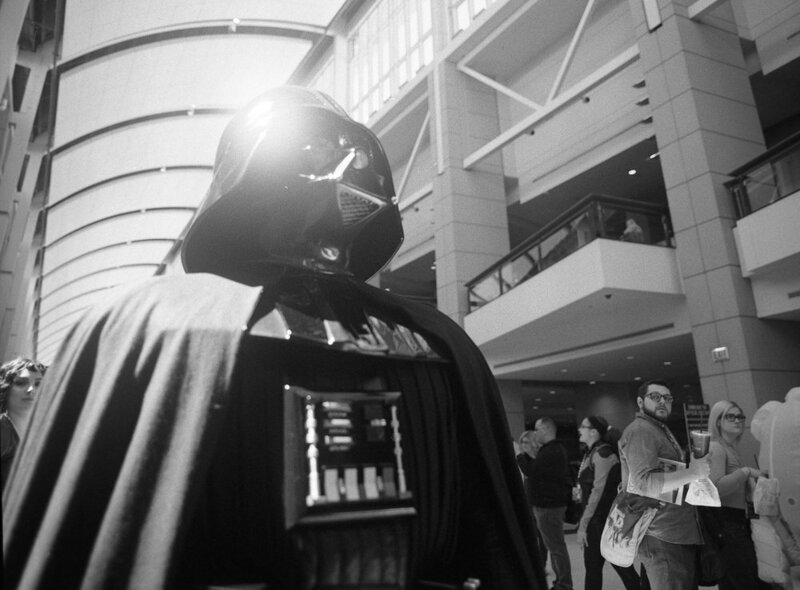 I really love going to conventions and this year's C2E2 was one of my favorite. This time, I pushed myself to engage even a bit more than last year with the people I took photos of. When I'm shooting, I try to have some more fun with it than what I see from most cosplay photos. It seems like a lot of them focus on just capturing as many cosplayers as possible, which gets exhausting and it winds up making everyone look the same. My approach was to take it slow, pick my shots a bit more and then add to the atmosphere. @surprised2cosplay as the joker was absolutely game for this sequence of shots and I was really surprised how well it came out. Darth Vader in the entrance hallway. There's amazing lighting here that it seems like photogs try to work against when shooting there. There was a lot of Black Panther cosplay, but this was one of my favorite low-key Killmonger looks. I ran into my friend, Keeley on Saturday and Sunday. She presented an excellent panel on plus size cosplay, in addition to this stellar Marceline The Vampire Queen from Adventure Time.